Changing rugs makes a difference in a room. Don’t underestimate the floor effect. In the past, I’ve done a post on the impact of changing rugs in a room. I saved a photo of a room with a rug I particularly like, then stumbled upon one of the same room with the carpet switched out. Now it’s happened again! Just as before, the first rug is an Oriental while the second happens to be modern. This dramatic house, by Los Angeles architect Stephen Kanner has a living room with an amazing view and classic 20th Century Mies van der Rohe Barcelona table and chairs so many architects favor. But my eye was immediately drawn to the warm colors of the fine antique Heriz rug, known as a Serapi, on the floor. If the rug in the picture is genuinely old, it can easily command a price in the $50,000 range. Serapis are very finely woven, which gives the design high definition. Colors are usually subdued compared to the vibrant reds, blues and rusts of Heriz. Serapi red is a softer, pumpkin color. The pile is lower and these are classic old-time Persian design and colors. The effect is classic. The strong character of the living room is pushed in a different direction by a boldly modern color-block rug titled Square Compressions. The architect, and his teenage daughter Caroline, designed and produced this collection in collaboration with Ariana Rugs, a gallery founded by two L.A. dealer brothers from Afghanistan in 1990. The spirited pattern of the contemporary carpet lacks the mellowness and subtlety of the antique floor covering but gives the room a freshness that feels contemporary on its own. I love the rugs, but especially the first one. What a beautiful view they have!! I’m really enjoying these articles that so dramatically demonstrate how much impact the rug can have. I need the side-by-side comparison to really appreciate it. Having said that, I have to say I prefer the Serapi rug. I am drawn to it’s warmth and juxtaposition against that very clean, sleek room. What a dramatic space this is — and the view! It is amazing the difference a rug makes. 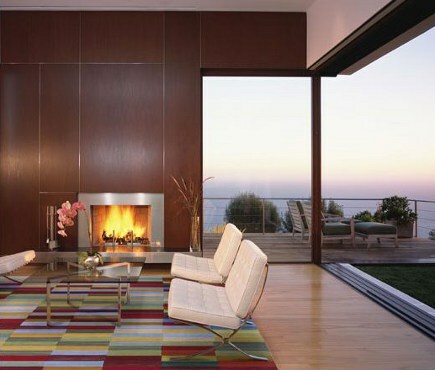 I’m kind of feeling partial to the more modern, colorful rug, but maybe that is my yearning for spring? Definitely, an incredible room with amazing views!! I love rugs and they can certainly change the personality of a room, even as small as mine is. I’ve been looking at some different styles and colors for my living room. It’s a big decision!